Your eyes aren’t deceiving you. You’ve closed a deal with financing, you’ve completed the project, the client is happy, and you’ve been paid. But that amount in your bank account looks smaller than you expected. 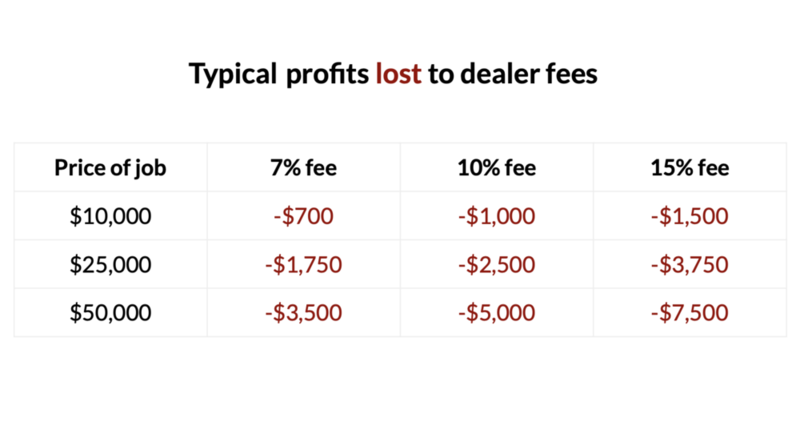 Chances are that you lost a percentage of your profits to dealer fees. Dealer fees are the amount you pay to financing companies. That amount, usually 7-15% of every financed job, cuts into your profit and can cost tens of thousands of dollars across jobs! In some cases, dealer fees can help you close more sales because they help financing companies offer your clients lower rates. In those cases, you’re covering the cost of your client’s interest payments. However, not every client needs these subsidized rates to move ahead with the project, and using dealer fees unnecessarily eats into your bottom line. If you already offer financing, you’ve probably seen the first-hand effects of dealer fees. If you haven’t offered financing before, the chart below shows you how much you could lose with one job! Imagine how your losses would balloon if you had three $50,000 jobs...or five...or ten. No matter how many projects you close, Hearth doesn’t take a dime out of your profits in per-loan dealer fees. Instead, we charge a one-time flat fee that doesn’t increase as you close more sales. Offer Hearth to your clients as a first financing option. Our network allows clients to check their eligibility and to see their rates--all without affecting their credit score. If they like what they see, you can offer a bid without worrying about the money you might lose. Using Hearth doesn’t mean getting rid of financial platforms that do offer dealer fees. Instead, the two can work in conjunction to bring your clients the options and the rates that work best for them. Next time you look at your bank statement after a job, the amount in there shouldn’t surprise you. Don’t lose thousands of dollars per job to dealer fees. With Hearth, all the money you make stays where it belongs: with you.